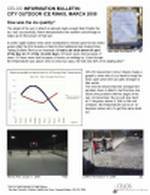 The City's outdoor single-pad hockey rinks in Central have fewer staff and less equipment than the same-sized City rinks in Etobicoke and North York . That means they often get ice maintenance only once or twice a day. When those rinks have lots of skaters, or there are anowflurries, the only way to keep the ice playable is for the skaters and the on-site Recreation staff to shovel. 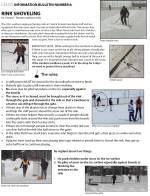 Most of rinks has been supplied with shovels metal snow-scrapers .Here is how to make it work. The Canadian Standards Association (CSA), is made up primarily of manufactures. In 1998 it Published a new "Playground Standard". These recommendations are not law, but some city governments treated them as if they were. 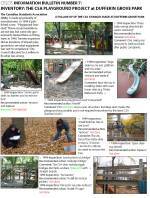 In 1999, Toronto inspectors did an inventory of all park playground to see what equipment was not "in compliance". City Council allocated $6.3 million to fix what was wrong. Neighbourhood parks are meant for people, and in a city as big as Toronto, parks get so much use that it can be tough on the grass. 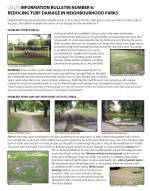 This bulletin examines the causes of turf damage and the remedies for it.....Parked vehicles actually do very little turf damage if the parking is occasional. Parks service vehicles routinely park in the centre of Dufferin Grove Park and all other city parks when grass is cut or an area is being serviced (washrooms needing plumbers etc.). In warm weather, parks are full of special events that involve parking for the whole day. A day or two afterwards, the grass is fine. Many parks have summer midways on the grass for up to three days, and still they recover fast. Fourteen Division Police officers have often said to park users and staff that Dufferin Grove Park is dangerous because of the level of criminal activity there. This seems surprising, but Fourteen Division management said that they are not permitted to give details. On September 20, 2005, CELOS therefore requested the following information through the Freedom of Information Act: (1) all Police Occurrence Reports relating to the park from January 2002 to October 2005; (2) all arrest reports from the park for the same period; and (3) all documented reports of citizen/police contacts in the park during the same period. It was understood that names and identifying details would be blanked out. Click on the bulletin on the right to read more. 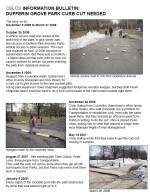 4.April 6 2008: Dufferin Grove Park Wading Pool Facelift. Financing: The cheaper the fix, the smaller the amount of money goes into the “capital projects” payroll account to pay the staff. They meet their payroll with a percentage of the borrowed funds for new projects. So small doesn’t work for them, and they need to push for big. But in this case, big doesn’t work for the taxpayers, or the environment. The good news: The City forester wrote in his report last summer that the big old shade trees around the pool might not survive the bulldozers necessary to remove all that concrete. So the architect was sent back to the drawing board. 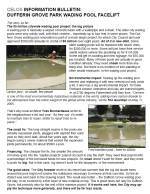 The result was better – the Dufferin Grove wading pool will stay, to be covered by a thin layer of new material on top. This is good news not only for Dufferin Grove, but possibly also for the rest of this massive project. If it works well here, the City may apply the technique more generally, and there will be far less waste. Click on the bulletin at the right to read more. 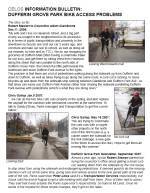 3.April 2 2008: Dufferin Grove Park bike access problems. 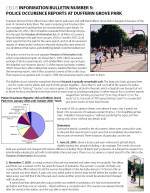 Dufferin Grove Park is heavily used, and it’s also a de facto bike route. There are a few measures recognizing this, such as the asphalt ramp leading down from the south traffic light on Dufferin, right beside the stairs. But many of the paths used by bikes in the park are unpaved, and so they get deep ruts. However, the existing asphalt path north of the rink could be branched, in the same way as this bike path at Trinity Bellwoods Park. Also there should be a curb cut allowing bike access at the north end of the park. 2. March 31 2008: "Dufferin Grove Park Curb cut needed"
What’s needed: A curb cut where the paved path meets the road, with or without moving the catch basin. Also the locking post needs removal because the base is too high -- even with the post in horizontal position, cars can rip out their mufflers (this happened to police). 1. March 25 2008: "City Outdoor Ice Rinks March 2008"
The additional cost if the city had kept all 49 oudoor rinks open fro two extra weeks to the end of March break = $514,668. If lots of people could skate, that would be okay. But not if the March sun makes the outdoor rinks unusable 40% of the time!